Vimeo slides are a slide type included in the MetaSlider Pro addon pack. A Vimeo slide will display a video in your slideshow directly from Vimeo. The video will automatically pause if the user skips to the next slide. 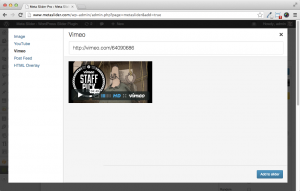 Click the ‘Add Slide’ button to launch the Media Manager and select ‘Vimeo’ from the left. Paste any Vimeo URL into the text input. A preview of the video will load in the space below. Click the Add To Slider button. The Media Manager will close and your Vimeo slide will be added to your slideshow.